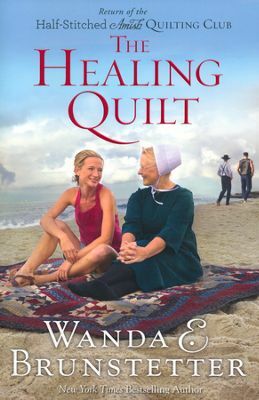 The Healing Quilt is a wonderful addition to the Half-Stitched Amish Quilting Club series. One of the best things about the story is the way Christian love is demonstrated in little ways that end up having a huge impact. A beautiful twist of events takes six strangers and intertwines them in a crazy turn of events. When old friends return to visit Emma and Lamar, there is romance brewing under the disguise of quilting. Lamar and Emma Yoder provide quilting classes and always end up with a mixed group of individuals. This was no exception. Each person in their class comes with emotional baggage and real life struggles. With kindness and love, Emma and Lamar create an environment where healing can begin for each of the quilting students. Without loud, boastful preaching, the couple gives wisdom and loving kindness to their students. The story is a delightful read that will keep the reader engaged all the way to the end. Although it is the last book in the series, it doesn’t require reading the books in order although I would highly recommend all of the Half-Stitched Amish Quilting Club books. I received this book from the Book Club Network in exchange for my honest opinion.